On a steamy July day, the idea of cooking over a hot stove can be almost too much to consider. Take out? Meh. Dinner at a favorite fresh-and-local specialty restaurant…again? Really? Ah, grill to the rescue! Besides the appeal of fresh air and the sense of festivity that just naturally comes with cooking outside, grilling has the advantage of getting that meal ready quickly. Grilling can even be a healthful choice as food prepared in this way often requires, and retains, less undesirable fat than pan-cooking may. That is—it CAN be a healthy choice. Be aware, though, that this kind of food preparation does come with a few dangers that are often overlooked when paired with that carefree atmosphere of celebration. Grill Tip 1: Prep safely. “Healthy fat” is a good starting guideline, but even good fats are not equal. 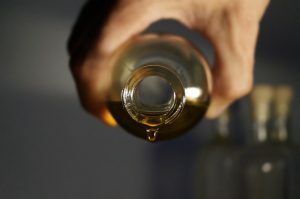 Extra virgin olive oil, for example, just isn’t optimal when it comes to grilling, which tends to produce higher heat than other cooking methods (more on that below!). Grill Tip 2: Don’t overcook. Grilling imparts a very pleasant, distinct flavor. That close, open heat also gives an appealing caramelized surface to almost anything—even grill-friendly seasonal fruits like halved peaches or melon wedges. Delish! But keep in mind that “grilled” and “burned” are worlds apart. Food that is overcooked doesn’t just dry out and have a strange texture; burned food also contains substances that are really not good for you. Char—that blackened, flaky surface that develops when food is scorched—is nothing more than a form of ash made of many chemical compounds, some of which are known carcinogens. Hold cooking heat down to medium. Got a gauge on your grill? Medium is 375 degrees, max. Moderate cooking temperatures decrease the risk of burning—and a lower stress level for the cook, too! Use gas or wood rather than charcoal. Of the three grill fuels, gas releases the fewest of the compounds that form char. Brine or marinate before cooking. 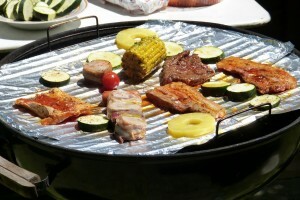 Foods that have been prepped this way are resistant to charring. Wink—now that’s a tasty “solution”! Grill Tip 3: Keep it clean. Outdoor dining can be a perfect situation for cross-contamination: Outside the kitchen, your usual assortment of equipment is a bit further away. 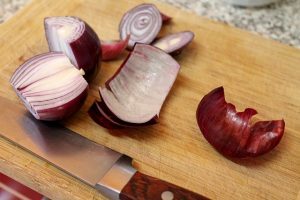 Cutting onions on the same board that was just used to trim raw meat may be convenient, as may turning chicken wings and veggie kabobs using the same tongs, but that also spreads harmful bacteria. To avoid cross-contamination (and its awful consequence, food poisoning), just think ahead. Have all the tools you need for every type of dish within reach before you begin. And remember, germs don’t take a break when the meal’s done. Refrigerate any leftovers promptly to keep spoilage—and another form of sickness—out of the equation. Grill Tip 4: A little spice is nice. …Just don’t overdo it! The celebratory feeling that comes with grilling can translate into a sense of abandon—and overindulgence in rich sauces and fiery spices easily follows. Rather than enhancing a dish, too much of these flavors can overwhelm it—and reminders of that excess may stick with a person over the next few hours. Heartburn or upset stomach, anyone? Seriously, watch the portions, both when adding seasoning during cooking or when serving yourself. Moderation is the key to enjoying it all, comfortably. I hope you have plans for some relaxed outdoor dining over the coming weeks. What better way than a satisfying, nutritious, safely prepared grilled meal to celebrate your happiness, vitality, and continuing journey toward your goals. Cheers!